in the Top 10 at the Fall CSD Quartet Contest! Get Home Brewed for your event! Choosing a name that describes a quartet is difficult. But, it was a perfect fit when we decided on Home Brewed, a name that evokes something with a great home-made, deep, rich flavor. Home Brewed gives you a stout taste of finely blended and aged (see – baritone) a capella harmony that ale will enjoy. 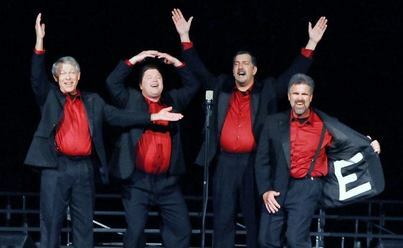 This versatile quartet will entertain you with music from a wide range of genres, from older standard favorites to swing and pop tunes that will keep your toes hop-ping. Whether you hear them now or lager, you’ll want more Home Brewed. Plus, as we always say, the more you drink, the better we sound! The quartet is made up of Bill "The Experienced One" Lamme (Baritone), Phil Fitzpatrick (Bass), Jeff Klemme (Lead), and Dale Clary (Tenor).